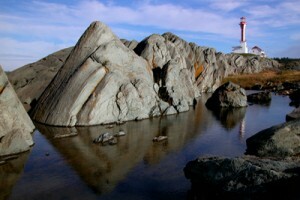 Cape Forchu lighthouse stands tall on a forked peninsula, just outside Yarmouth on Nova Scotia’s southern tip. The beacon marks the start of a popular coastal drive to Halifax. Between late May and early October you can visit a museum and have tea inside the lighthouse. The spacious grounds make a great picnic spot and there’s even wireless internet available if you need to check emails. Three bodies of water – Yarmouth Harbour, the Atlantic Ocean and Bay of Fundy – surround the lighthouse, which is known for its unique shape, often likened to an apple core. It has a long history. The cape was named by explorer Samuel de Champlain in 1604 and a light has been burning here since 1840 to protect ships from the shore. For more information, see the Cape Forchu Lightstation website.